"I recently (at 33 years old) learned I am gluten-intolerant and have begun exploring gluten-free cooking. 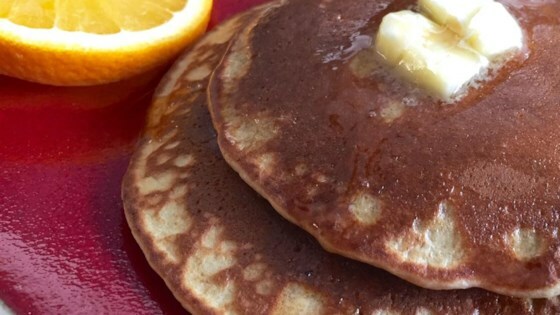 We love pancakes in my house, and I created this recipe to fill the void. We all gobble them down!" Stir quinoa flour, baking powder, and salt together in a bowl. Stir flaxseed milk, eggs, melted butter, and honey into the flour mixture until you have a thin batter. Pour 1/4 cup batter onto your hot cooking surface per pancake and cook until bubbles form on top, 2 to 3 minutes. Flip the pancake and cook until browned on the bottom, about 2 minutes more. Quinoa flour can be bought, but can also be made by grinding quinoa in a grain mill or coffee grinder. Food processors (even the most high-end) are not able to grind the quinoa into a flour, only a course meal. These pancakes will not turn out using a course meal; flour is necessary. Used almond milk instead, but used with our waffle maker and the whole family loved them - age 6 to 76! When I first made these pancakes I didn't care for them too much but now I love them. I eat them all the time. I use my almond milk in it and put some flax seed and chia in it.